The 31 Days to Make a Difference campaign launches on World Water Day (March 22, 2012) and runs through Earth Day (April 22, 2012). By simply texting DROP to 89544 on their U.S mobile phone people can automatically donate $5 to the Give A Drop campaign which funds building wells and clean water access points in Africa. In Africa, rural women walk at least 10 miles a day to get water, and young girls must often leave school to help their mothers carry water. 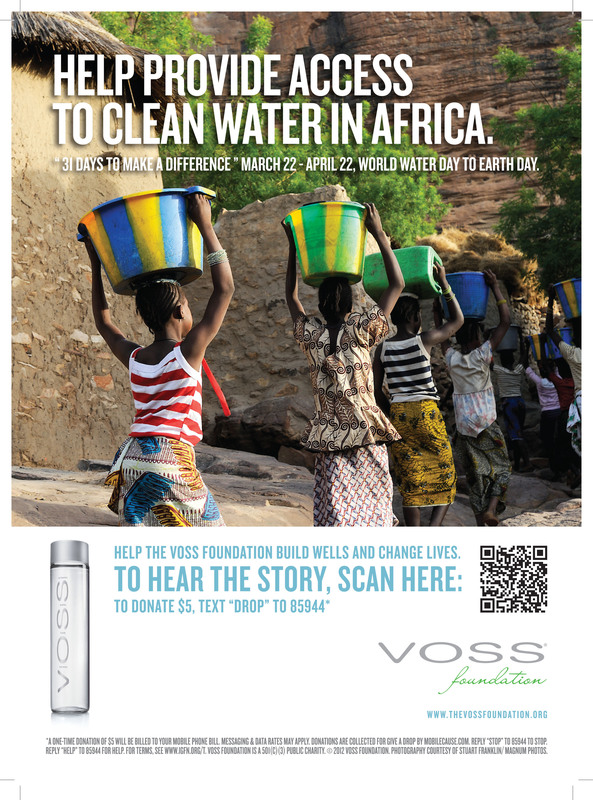 Voss water is honored to be associated with the Voss Foundation and its vital work saving and changing lives in Africa. We remain devoted to the mission and are proud to continue our support of the Voss Foundation,” says Voss CEO Jack Belsito. VOSS Artesian Water from Norway is pleased to announce the second annual 31 Days to Make a Difference campaign which launches on World Water Day. 31 Days to Make a Difference is an international campaign designed to communicate the global need for clean drinking water solutions. The campaign benefits the Voss Foundation with all donations going to support building wells and clean water access points in Sub-Saharan Africa. 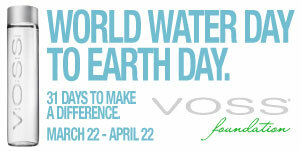 The campaign begins on World Water Day (March 22, 2012) and runs through Earth Day (April 22, 2012). By simply texting DROP to 89544 on their U.S mobile phone, people can automatically donate $5 to Give A Drop. There are more than 300 million people in Sub-Saharan Africa who lack access to clean water. Since 2008, the Voss Foundation has helped construct 36 water access points in five countries, changing the lives of more than 100,000 people in Kenya, Mali, Ethiopia, the Democratic Republic of the Congo and Liberia. The water crisis in Sub-Saharan Africa is especially devastating to women and young girls. In much of Africa it is culturally considered a woman’s job to carry water. The UN estimates that women in Africa regularly carry, on average, 20kg or 44 pounds of water on their head. Many girls suffer developmental deformities from carrying heavy loads at a very young age. Rural women walk at least 10 miles a day to get water, and young girls must often leave school to help their mothers carry water. Give A Drop is a partnership between Project Clean Water (founded by Jewel in 1997), the Voss Foundation and Virgin Unite that was created to address the worldwide water problem and bring solutions to areas with no access to clean water. There are several ways to donate. By simply texting DROP to 89544 on their U.S mobile phone people can automatically donate $5 to the Give A Drop campaign. Or people can scan the 31 Days QR Code which is directed to the Voss Foundation mobile site, making it easy for people to donate any amount on their smartphone anywhere in the world. Contributions can also be made online at http://www.thevossfoundation.org. The Voss Foundation is a non-profit organization dedicated to providing access to clean water to communities in Sub-Saharan Africa and raising awareness of the ongoing need in the region. The Voss Foundation has a particular interest in assisting women and girls, who, relieved of the burden of fetching water, have time to devote to education and enterprise. Founded by VOSS of Norway ASA as an independent 501(c)(3) public charity, the Voss Foundation has offices in New York and Oslo. VOSS Artesian Water is among the purest of all major water brands. VOSS is committed to the environment, and maintaining 100% carbon neutrality, through a set of comprehensive, environmentally friendly measures. For additional information about VOSS Water visit http://www.vosswater.com. For additional information about The Voss Foundation, visit http://www.thevossfoundation.org. When you text DROP to 85944 on your U.S. mobile phone, a one-time donation of $5 will be billed to your mobile phone bill. Messaging and data rates may apply. Donations are collected for Give A Drop by mobilecause.com. Reply STOP to 85944 to stop. Reply HELP to 85944 for help. For terms, see http://www.igfn.org/t. Rural women walk at least 10 miles a day to get water, and young girls must often leave school to help their mothers carry water when their families grow large. Text DROP to 89544 on your U.S mobile phone to automatically donate $5 to the Give A Drop campaign The opening ceremony of the Voss Foundation water project in Latawken, Kenya photo credit Rachel K.B. Troye Women in Africa regularly carry, on average, 20kg or 44 pounds of water on their headMore than 300 million people in Sub-Saharan Africa who lack access to clean water.